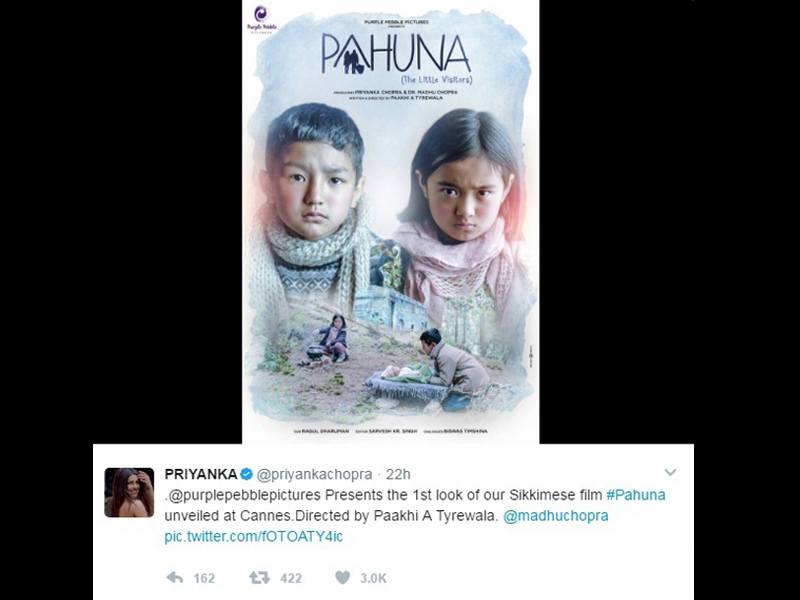 Priyanka Chopra is producing a Sikkimese film “Pahuna”, under her production house Purple Pebble Pictures and the first poster of the film was unveiled at the Cannes Film Festival. “Pahuna” is directed by Paakhi A. Tyrewala and the story revolves around three Nepali children, who were separated from their parents while escaping the maoist agitation from Nepal to Sikkim. The film is produced by Priyanka Chopra and her mother Madhu Chopra and stars Ishika Gurung and Anmol Limboo in lead roles. The first look of the film was launched by Priyanka’s mother Madhu Chopra along with her son Siddharth Chopra and director Paakhi A. Tyrewala at the prestigious Cannes Film Festival on May 21st 2017. The “Quantico” star shared the first look of the film on Twitter.